Préamplificateurs basses Il y a 2 produits. The Ampeg Classic Analog Bass Preamp pedal is like having a choice of Ampeg amps right on your pedal board. Dial in a wide range of authentic Ampeg tones with the 3-band tone stack and highly flexible Ultra-Hi and Ultra-Lo circuits. 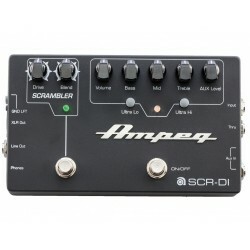 It’s the most affordable way into the pure analog bass tone of Ampeg.